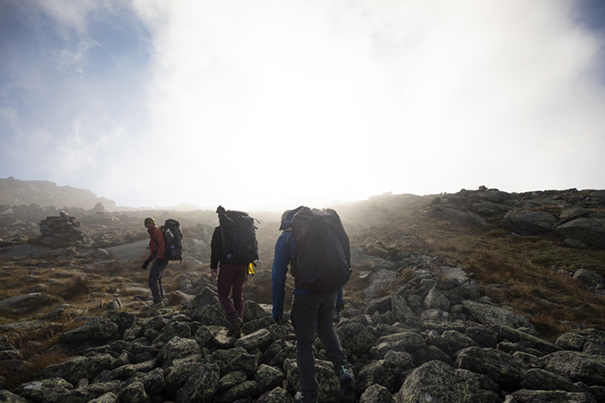 In New Hampshire’s White Mountains, the Appalachian Mountain Club’s hut “croos” work around the clock to provide one of the country’s most unique backcountry shelters. It’s called packing a century. 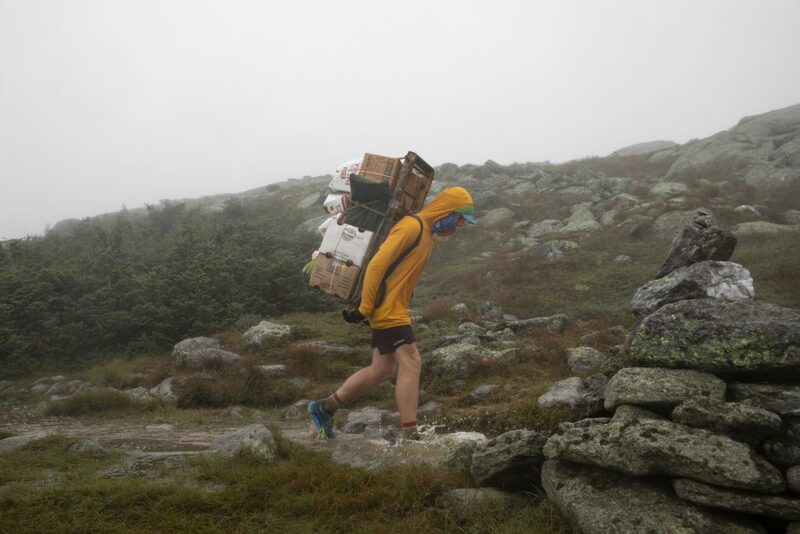 That’s when a member of the Appalachian Mountain Club’s hut crew (or “croo”, as it’s known) loads 100 pounds of food and supplies onto a wooden packboard and hauls the load from trailhead to hut. It’s a right of passage made more difficult by the packboards themselves, which weigh 10 pounds unloaded. They’re made by the AMC’s construction team, for the sole purpose of transporting heavy, awkward cargo. They have no cushy padding and no hipbelt. 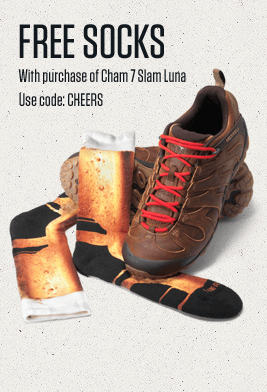 They have leather shoulder straps. Names and years of past croo members are carved into the wood frames. At Lakes of the Clouds hut, on the shoulder of New Hampshire’s Mt. Washington, fresh supplies get packed in every Wednesday. On this Wednesday at the end of August, a storm blankets the 6,289-foot mountain, making for tough conditions. Kevin French, 23, determines the conditions are not great for packing a century. Today he decides to carry “only” 94 pounds of groceries. 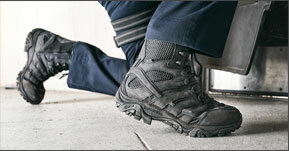 After lashing boxes to the wood frame, he hefts the load and bolts down the 1.5-mile trail like he’s carrying a daypack. The rocky trail is slick with rain, and 40-mph gusts whip clouds across the tundra, but nothing slows Kevin down. He skitters down the path wearing trail runners and shorts, seemingly oblivious to the pack and the weather. It shouldn’t be surprising. After three years seasons as a member of Lakes of the Clouds hut croo, making the trip weekly all season long, he’s had practice. 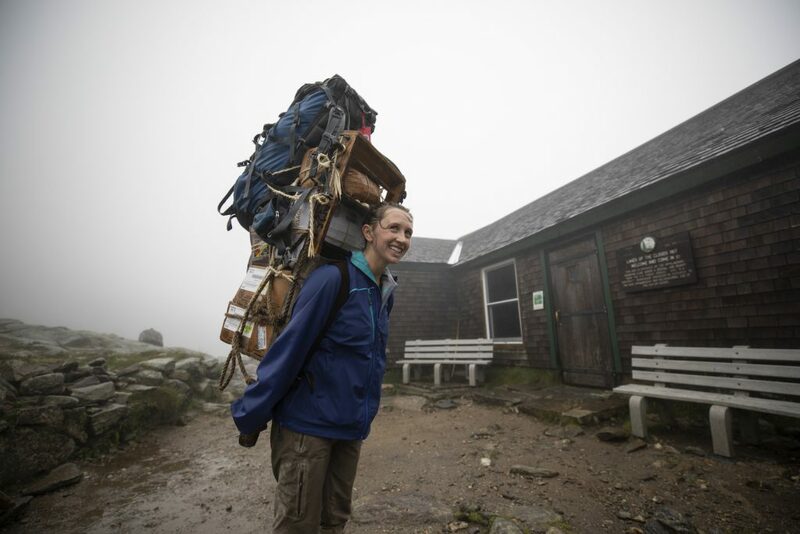 Hut workers like Kevin have been packing centuries into the White Mountains for generations. The Appalachian Mountain Club was founded in 1876, and the first hut, Madison Spring, was built just over a decade later. In subsequent years, seven more huts were added, creating a network of backcountry shelters in the Whites. Lakes of the Clouds, the highest and largest hut, accommodates about 90 hikers almost every night from the end of May to the middle of September. 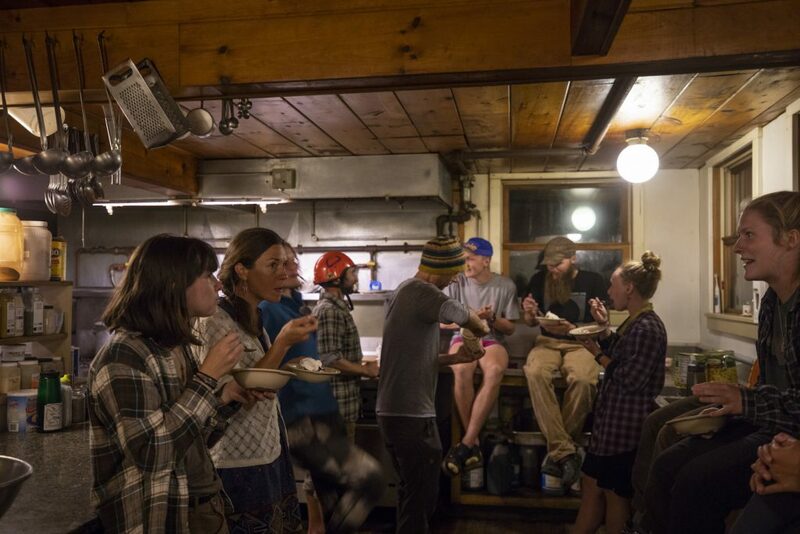 The nine-member hut croo cooks dinner and breakfast for guests (which requires packing in about 1,000 pounds of food each week), does an army’s worth of dishes daily, cleans and maintains bunkrooms and composting toilets, checks hikers in and helps them find bunks, and even squeezes in lessons on the local environment. And they perform the occasional skit. It’s like a Swiss Alps refuge crossed with summer camp. Of course, the huts aren’t all fun and games. The weather in the White Mountains, especially on Mt. Washington, can turn dangerous any time. The summit of Washington has recorded wind speeds of more than 100 mph in every month of the year (its record is 231 mph), and a low of 8°F in midsummer. In fact, Lakes of the Clouds hut was built in 1915 because of the mountain’s extreme conditions. Two AMC members who were out hiking got caught in a storm near the lakes high on Mt. Washington and died from exposure. At 5,032 feet, the hut stands where they perished. The huts still provide emergency shelter to anyone in need. 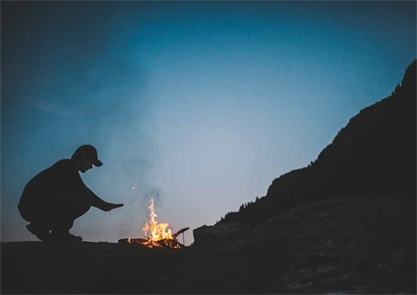 Thru-hikers who get caught by the weather are allowed to sleep on the floor, and dayhikers routinely drop in to warm up or just get drinking water and use the bathroom. On the day we visit, the Lakes of the Clouds hut is crowded with soaking-wet hikers. A steady stream of fresh-baked treats emerges from the kitchen, to go along with the hot chocolate and coffee. Meanwhile, Kate is hard at work on tonight’s dinner. 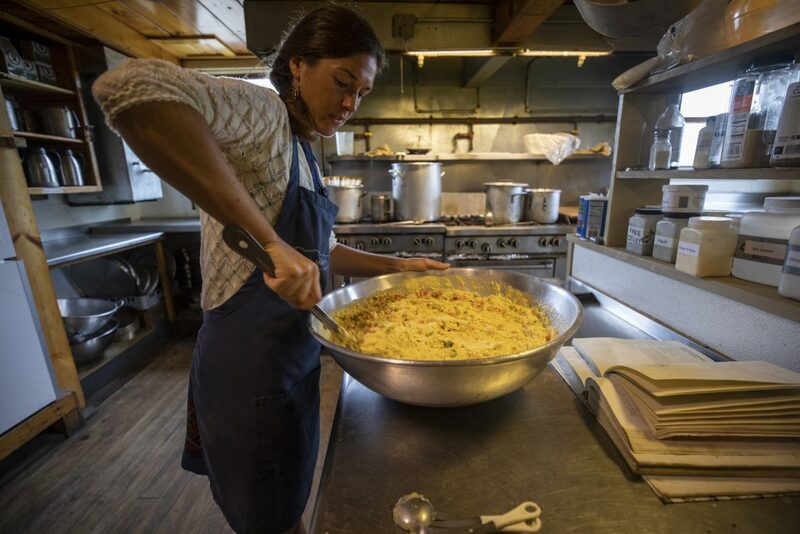 Every single day of the season, one of the hut croo spends 15 hours cooking dinner and dessert for 90 trail-hungry hikers. 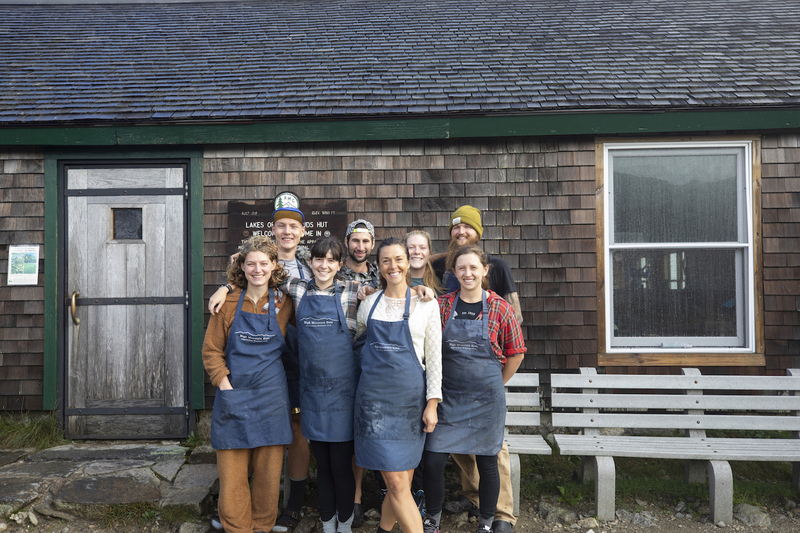 They take turns at kitchen duty—no special treatment—so even though Kate is the hut master, she gets a shift same as the others. She’s making cheesy cornbread, chili, salad, and pulled pork. 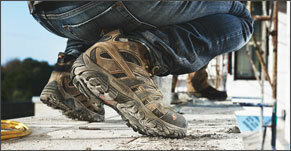 The Merrell Magic team is here to turn the tables on the hut croo. Kate, Kevin, Ashley, and the other six members of the Lakes of the Clouds staff spend the season doing back-breaking work to help hikers. For one day, it’s their turn to get treated like guests. What’s in store? We’ve brought a professional masseuse. And all the fixings to make ice cream sundaes. And costumes (hut croos like to dress up). For the rest of the afternoon, the croo rotates through the massage station, each one taking a break from hut duties for a relaxing workover. “Wow, that is a luxury I’m sure has never been experienced anywhere in the hut system,” says Kevin in post-massage bliss. At 5 p.m., the rejuvenated croo assembles in the kitchen. It’s “go time”—when they go over final steps for serving dinner and then fan out like a drill team, ferrying dishes, pitchers of water, pots and bowls and pans loaded with food. The meal is served family style, with croo members weaving through the long wooden tables to deliver extra helpings. By 9 p.m., the dishes are clean and the kitchen is ready for the next day’s breakfast rush. At 6 a.m., the croo will be up making almost 100 plates of pancakes. But for a moment, there’s no work that needs doing. The day’s duties are done and there’s only one thing left to do: eat ice cream. It’s the croo’s turn to be served.